1. Do all the necessary prep work: It is difficult to write a lab report on something you do not fully understand. Make sure that you have completed the activity you are writing a report for. If it is an upper division course make sure that you have also researched a couple peer reviewed articles that you can use in your report. I find it helpful to use google scholar or ProQuest via the library’s page to search for articles. You do not always have to read the entire article but always read more than just the abstract. If you are using the paper to reference how another scientist used a method that you are using just read the methods section, if you are interested in the overall concepts – skim the introduction, skip the methods and thoroughly review the results (including tables and figures) and the discussion. 2. Methods: Now you are ready to start writing your lab report. Start with the methods section, you will be telling the reader exactly what you have already done so it is usually easier to start here rather than the introduction. You’ll need to explain where the study took place, the specific techniques used to gather your data and how you analyzed your data. Stating you used excel is not the same as pointing out your unit of analysis and the tests you used, such as an ANOVA. This is where you may need to cite a paper that summarizes the same technique you used so you do not have to repeat another scientist’s work such as; we followed the protocol for assessing body condition established by Smith et al. 2010. 3. Results: Next you’ll need to tell the reader what you found from your data collection. This section is generally quite short and includes at least 1 or 2 tables or figures. These are helpful because they efficiently summarize information you are trying to communicate to the reader. Be sure that your captions for the tables and figures are stand alone. They should tell what the figure is showing, when and where the study took place, the hypothesis your data is supporting or refuting, the sample size and p-value. The reader should be able to flip to just your figure and understand what is going on without any outside information. It is okay to have long figure captions. You also must have a few sentences in which you refer to the figure. This is done by often stating the most important statistic, such as; tracks of white-tailed deer were seen most often in deciduous forests (figure 2). 4. Introduction and Discussion: Next you will write your introduction. This is generally done in 3 paragraphs. The first is very general and brings up the idea that your research is based on, you will need to cite other papers in throughout the introduction. The second paragraph talks more specifically about your interests in the study and where your study took place. The final paragraph should clearly outline your goal (the overall reason for your research) and all of your objectives. These should be specific and measurable. For example a goal: Understand the relative abundance of chickadees. Objective: Use point counts to determine the number of chickadees in the deciduous, coniferous and mixed forest stands. In addition you may include your specific hypothesis: we expect there to be the most chickadees in the mixed forest. 5. Abstract: This is the final piece to your lab report. You do not have to cite and it should all be in one paragraph. Use the first 1 or 2 sentences to summarize your introduction and specifically state your objectives. Then mention the methods you used. Next explain your results including p-values and sample size. Finally explain the conclusions you drew and their implications. This summarizes the whole paper and tells the reader whether or not your work is relevant to them. It should be clear, concise and logically done at the end because it incorporates all pieces of the lab report. 6. Proofread: This is your very last step. 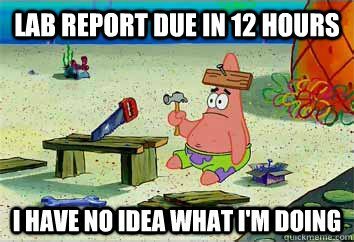 Take an hour or two break and then proof read your entire lab report from start to finish. Correct any formatting issues or small grammar mistakes. If your professor has provided a check list for you go through and ensure that you have done all the things that he or she asked you to include. Writer BIO: Claire Nellis is a Senior in the Fisheries and Wildlife Sciences Program. Claire has worked in the Academic Success Center throughout her time at PSC as a Peer Tutor, Writing Center Tutor and Supplemental Instruction Leader. If you need more help with lab reports or any written assignment, visit Claire in the Writing Center on Mondays and Thursdays.